Take this one with a grain of salt; a big one. According to The Daily, the iPad only News Corp. daily newspaper, Microsoft is working on a version of Microsoft Office for the iPad. Just imagine being able to run Word, Excel, and PowerPoint natively on your iPad. Sounds too good to be true? It might be. Microsoft has come out denying that they are working on an iOS edition of Office and that The Daily flat out got bad information for their exclusive scoop. I read the report this morning, interestingly enough, on my iPad while reading The Daily. You can read the full story on The Daily website. "A Microsoft spokeswoman issued this statement: “The Daily story is based on inaccurate rumors and speculation. We have no further comment.” She added that a screen image included with The Daily’s article showing an Office product for iPad was “not Microsoft’s software,” she said. But perhaps that isn’t the entire story. 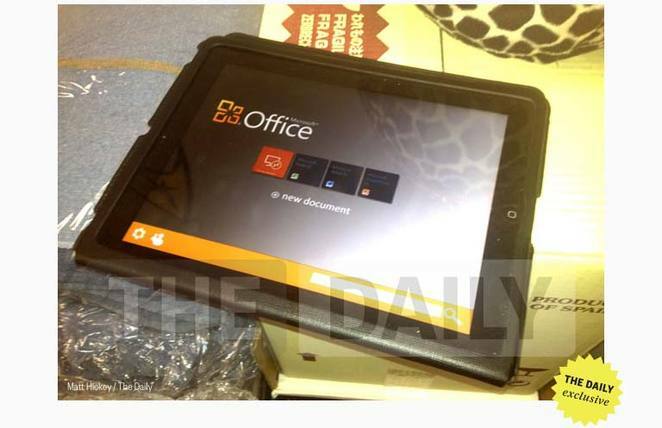 Peter Ha, tech editor at The Daily, said that a Microsoft employee had demonstrated a version of the app on an iPad. “The launch screen may not be final, but the app itself is real,” Mr. Ha said. “We were told that the app was done and it was being tested internally.”"
So is Microsoft working on a version of Office for the iPad? They might be. And they might not be. 1. Windows and Office have long been cash cows for Microsoft. By releasing Office for the iPad, Microsoft opens the door to some 55 million plus new customers. 2. Microsoft Office is the de facto office productivity suite, and now we can get Office on our Windows, Mac, and iOS devices; there by eliminating a number of cross platform translation and formatting headaches. 3. Chances are that you've used a version of Office before and you will be instantly familiar with how to use the software. 1. Microsoft wants to keep Office as a Windows Phone 7, Windows 8 Tablet Edition exclusive to help differentiate tables and phones running Windows from those running Apple's iOS, Google's Android, or RIM's BlackBerry OS. 2. The iPad is regarded, by-and-large, as a content consumption device, not a content creation device. There may not be a strong demand for Office-on-an-iPad to justify the cost to develop the software. 3. The development of iOS applications will draw resources away from the Windows and Mac OS X Office development teams. Personally, I think Microsoft is testing the water for iOS applications. They've already released Bing, MSN for iPad, OneNote and Microsoft Lync 2010 for iPad. There are a few iPhone applications also, including SkyDrive, Windows Live Messenger, and Photosynth. That's a lot of toes to dip in the water without developing a full blow Office suite. I think OneNote and Lync 2010 are strong indications that Microsoft is at the very least, considering releasing a version of Microsoft Office for the iPad. Only time will tell.